Creating a “pet-friendly” hospital, shelter, or petcare business is a simple, inexpensive path to improved efficiency, increased staff safety, happy pets, and clients who feel a bond with your business. Learn how in this fun and fascinating series of lectures taken from a half-day seminar given by veterinarian, animal behaviorist, and author, Dr. Sophia Yin. Dog and cat bites are the most common cause of injury in the veterinary hospital or pet care setting. Failure to recognize the subtle indicators of fear and anxiety, paired with improper handling, can lead to animals who may leave medically better but behaviorally worse. See how a more skilled approach to interacting with these pets will help you quickly win their trust, allowing you to avert potentially dangerous and stressful situations. Recognize how unruly behavior and overarousal can lead to aggression, and learn the general approach to addressing these issues. Flooding, desensitization, classical counter-conditioning, and operant counter-conditioning are the 4 methods of behavior modification, but which one should you use? Many people are familiar with the terms and techniques but may lack the full knowledge needed to apply them appropriately. Improper or unskilled application can cause animals’ behavior to worsen. Discover how understanding the underlying principles and observing the animal’s response can increase your level and speed of success. Learn the 4 methods of behavior modification: flooding, desensitization, classical counter-conditioning, and operant counter-conditioning. Understand why desensitization and counter-conditioning are generally safer, faster, and more effective than flooding, which can be associated with adverse effects. See the common mistakes that people make when trying to desensitize and counter-condition. Discover the factors that are essential for performing the techniques safely and efficiently. Low Stress Handling® & Restraint of Difficult Dogs and Cats. Are you routinely scruffing, stretching, or struggling with cats, or do you find that you have difficulty with hyperactive, fearful, or aggressive dogs? Learn Low Stress Handling® techniques that apply to even the most difficult patients. 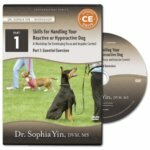 From creating a calm, inviting environment, to using towel wrap techniques, to multiple methods for handling pets of different sizes and temperaments, you’ll learn principles and techniques that allow you to adjust to the patient’s needs. Put it all together and you’ll create a more Pet-Friendly hospital or petcare business. Understand how every interaction – how you approach animals, pick them up, move them from place to place, or restrain them – affects the animal’s perception of your and his willingness to cooperate. Realize that animals don’t understand human language, and how miscommunication can cause them to become frustrated and confused. Learn the principles of how to position your body, place your hands, and adjust your movement to provide the direction and guidance the animal needs.